← Your photo options: digital files only, fine art albums or fun 3D viewmaster! 1. For the seaside/beach wedding- Melissa + Karl Lagerfeld- "incense pistachio gloss"
From the people who brought you the extremely popular Vivienne Westwood Lady Dragon heart peep toe slingbacks now give you KL's ice cream courts. The white one would be PERFECT for a quirky seaside wedding, the back of the black version shows you how cool it looks! You can even get the white versions in a variety of "flavours". This is pistachio, but you can also get vanilla and raspberry ripple!! Amazing! 2. For the Alice in Wonderland wedding- Irregular Choice- "flopsy"
As soon as I saw these bunny shoes I knew they were perfect for a cute Alice in Wonderland themed wedding! Garrrgh! If I had the skills to walk elegantly in high heels, these would be it for me! Irregular Choice also have a specific bridal section so their website is well worth checking out! Unfortunately Flopsy is very hard to get hold of online, I found them still selling in the Carnarby Street store so it might be a case of ringing them directly to reserve them! 3. For the punk wedding- Iron Fist- "distant memory"
For the proper punk rockers of you out there, Iron Fist offers a wide range of skull themed studded shoes, beautiful! At the time of this article, these are only £21 on sale right now!! 4. For the non-heeled Cinderella wedding- Melissa + J Maskrey- "ultragirl diamante clear pumps"
Another offering from the vegan plastic shoe company (I'm not going to lie I'm a massive fan! ), for those who don't dig heels but want something unique that will impress! Also, it'll keep your feet dry in the rain so that's an extra bonus! 5. For the mega extravagant wedding- Anastasia Radevich- Anything! 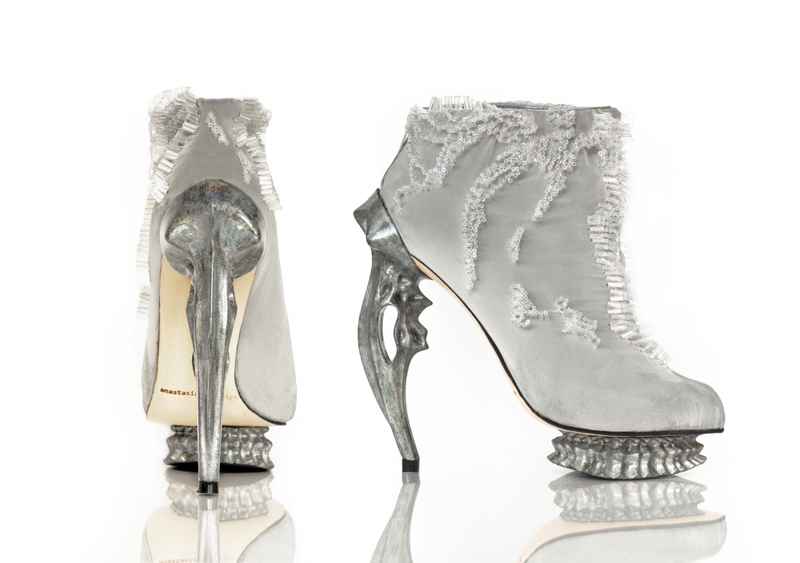 This Canadian lady is truly an artisan of beautiful and outrageous shoes! The ones I found that I think would be ace for an extravagant, eccentric wedding are these oyster and pearl themed shoes (you know I love the sea), but sadly I think they're a few seasons back so chances are you would struggle to find them now. I don't even know how much they cost (I imagine it's a lot) but I thought they were so wicked that they were still worth a mention! I've also popped up a few other Anastasia's that I think would look incrediballs under a wedding gown! This article was posted in Alternative Wedding Inspiration, Stuff For Married-To-Be's and tagged alice, alternative, beach, bunny, cinderella, destination, diamante, eccentric, flats pumps, flopsy, fun, heels, irregular choice, karl, lagerfeld, london, oyster, pearl, photography, punk, quirky, rock, roll, seaside, shoes, skulls, studded, unique, wacky, wedding, wonderland. Bookmark the permalink. Follow comments with the RSS feed for this post.Post a Comment or leave a trackback: Trackback URL.